1760-1835. He was born on 8 June 1760, the second son of a ship-owner, Richard Moorsom, of Airy-Hill, near Whitby, Yorkshire, and of his wife, Mary Ward. Having been classically educated at Scorton near Richmond in Yorkshire, Moorsom entered the navy at the unusually late age of sixteen under the patronage of Captain Hon. Constantine Phipps, the later Lord Mulgrave, as a midshipman aboard the Ardent 64 in March 1777, seeing service in the Channel and the Bay of Biscay. 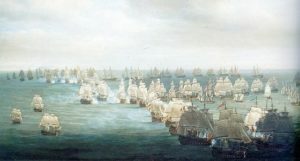 He removed with Phipps to the Courageux 74 in early 1778, and was present at the Battle of Ushant on 27 July, the relief of Gibraltar by Vice-Admiral George Darby on 12 April 1781, the brilliant capture of part a French convoy by Rear-Admiral Richard Kempenfelt on 12 December 1781, and the relief of Gibraltar by Admiral Lord Howe’s on 18 October 1782. He was still an acting-lieutenant when the Courageux was paid off at the peace in 1783, but having subsequently passed his examination he was commissioned on 5 January 1784 and joined the Sphinx 20, Captain John Markham at Gibraltar. A short time afterwards he transferred to the Thetis 38, Captain John Blankett, serving in the Mediterranean and proceeding to Greece in search of an English ship which had been carried away by her crew. In 1786 the Thetis was paid off. At the end of 1787 Moorsom was appointed to the sloop Ariel 14 at Sheerness, which vessel remained at Spithead until the beginning of 1789 when she was attached to the expedition under Commodore Hon. William Cornwallis for the East Indies. After delivering despatches to Guernsey the Ariel rejoined the commodore at Tenerife where Moorsom was appointed her acting-commander. Upon entering the Indian Ocean the Ariel separated once more to investigate the island of Diego Garcia before rejoining Cornwallis at Calcutta, where unfortunately on entering the river her crew were infected by a fever that caused many deaths. Moorsom was then charged with exploring to the eastward, in the course of which he visited the Nicobar Islands and Sumatra. On returning to Calcutta he was ordered to deliver money to the Isle de France, but as his crew was reduced by illness again he was obliged to put the money ashore at Madras, whereupon he invalided home himself, taking passage in the East Indiaman Princess Royal. After arriving home in May 1791 he found that he had been posted captain six months earlier on 22 November 1790 in a general promotion. In early 1793 Moorsom was appointed to the thirty-four year-old frigate Niger 32 and sent to Brest to report on the strength of the French fleet, before seeing service in the Downs under Rear-Admiral John Macbride and then in the Channel Fleet under Admiral Lord Howe. He was superseded on the orders of Howe in July by Captain Hon. Arthur Kaye Legge, but shortly afterwards joined the frigate Astraea 32 with which he brought home the Baltic trade at the end of the year prior to returning to Deptford in January 1794. The Astraea was then engaged in convoy duty to Ostend and Ireland in the spring, and Moorsom had left her by the summer. He was appointed for a short while to the newly-purchased East-Indiaman Hindostan 56 in the spring of 1795, serving in the North Sea, but when this vessel was converted into a troop ship he resigned the command and remained unemployed until late 1804, during which long period on the beach he made his displeasure known to the government. Only on the return to office of William Pitt did he find employment, no doubt through the influence of the Chancellor of the Duchy of Lancaster, who as the 3rd Lord Mulgrave had succeeded his brother and Moorsom’s patron, the late Captain Lord Mulgrave, in 1792. Joining the Majestic 74 at Great Yarmouth, Moorsom’s ship formed part of Rear-Admiral Thomas Macnamara Russell’s squadron off the Texel. In April of the following year he was appointed to commission the brand new Revenge 74, fitting her out at Chatham and becoming attached to the Channel fleet off Brest before joining Vice-Admiral Sir Robert Calder’s reinforcements to the Mediterranean fleet off Cadiz. At the Battle of Trafalgar on 21 October 1805 the speedy Revenge was eighth in line and performed excellently whilst being attacked by a good number of the enemy’s centre, suffering twenty-eight men killed and fifty-one wounded, the latter figure including Moorsom. He was accorded the honour of carrying the great banner at Lord Nelson’s funeral on 9 January 1806, and he resigned the command of the Revenge in the same month to be replaced by the unpopular Captain Hon. Charles Elphinstone Fleeming. In June 1807 he became the private secretary to Lord Mulgrave, the first lord of the admiralty, was appointed a colonel of marines in May 1808, and served as a lord of the Admiralty for a short while from March 1809 until July 1810 in succession to Captain William Johnstone Hope, his tenure in office including the period following the fiasco of the Battle of the Basque Roads on 11 April. He then became an active and impressive surveyor-general of the Board of Ordnance in July 1810, which position he held until March 1820. Moorsom was promoted rear-admiral on 31 July 1810, and on 15 January 1812 became the M.P for Queenborough. He was further advanced to the rank of vice-admiral on 4 June 1814, created a K.C.B. in 1815 and was commander-in-chief at the Nore from 1824-7 with his flag flying on the Prince Regent 120, Captains William Henry Webley Parry, and from December 1825 his son, Captain Constantine Richard Moorsom. Moorson was advanced to the rank of admiral on 22 July 1830, and having retired to Cosgrove Priory in Northamptonshire he died there on 14 May 1835 to be buried in St. Peter’s Church, Cosgrove. He married Eleanor Scarth 1765-1828, of Stakesby, near Whitby on 14 June 1791 and had issue three sons and a daughter. Two of his sons joined the navy, these being Constantine Robert Moorsom, who was born on 22 September 1792, entered the Navy in 1807, was posted captain in 1818, served as acting-commander-in-chief at the Cape following the death of Commodore Joseph Nourse in 1824, and was flag-captain to his father at the Nore from 19 December 1825 until the summer of 1827. The other son who joined the Navy, Henry Robert Moorsom, died in command of the sloop Jasper in 1826. His third son became an army officer and civil engineer, and his daughter married the Reverend Henry Mansel of Cosgrove in Northamptonshire. Moorsom served as the M.P for Queenborough from 1812-20 in the Government interest, and was regarded as an efficient officer and administrator. His residences were variously given as Upper Stakesby, near Whitby in Yorkshire, 21 Brompton Road, Middlesex, and Cosgrove Priory, near Northampton. A protégé of Lord Mulgrave, he was a humane captain who got the best out of his crew and took particular interest in the development of his younger officers, showing them great kindness. To his credit, on leaving his command at the Nore the one promotion traditionally allowed him from midshipman to lieutenant was given to an officer who had no connection to Moorsom, but had performed his duty well. Cool in action, his scientific qualities were greatly admired and his knowledge of gunnery made him a worthy surveyor-general of the Ordnance.